Though he never won a major road race, he was often victorious in hillclimbs driving his own 'Montier Speciale'. Charles Montier was born in Napoli. His mother was Italian and his father was blacksmith in rural France, living in Richelieu, Indre-et-Loire. While still in his teens, he helped his father build a steam powered wagon. Later he moved to Paris and worked for the Darracq firm after his military service, later he had a garage at Puteaux and was the distributor of Siva cars and, from 1912, Ford. 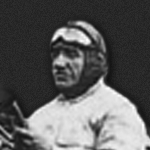 He moved to Paris and in 1923 after he criticised the ACF after they refused his entry for the Touring car race at the GP at Tours, he took revenge at Le Mans, finishing the first running of the 24 hour race, sharing a 2-litre Ford Montier Special with his brother-in-law Albert Ouriou in 14th place. In the 1924 and 1925 Le Mans races, they were forced to retire. Charles and his son Ferdinand both raced. Respectively 9th and 10th of the Coupe de la Commission Sportive in 1927, Charles and Ferdinand gained their best results in the Grandes Epreuves during the 1930-1931 seasons, in the Belgian GP at Spa (6th, then 7th). In other races, at La Baule in 1926, the Montier Special finished second in the GP behind the Delage of Louis Wagner, and took fifth in the Rally du Soleil. Charles specialised in American Fords and in 1930 he built a special based on a Ford Model A. He entered a "Montier Speciale" Ford car in the the Belgian Grand Prix in the hope that amateur drivers would show an interest and buy one. The 1933 Montier Speciale featured two Model A four cylinder engines mounted inline to create a straight eight. This was built on one of his 1930 Model chassis and fitted with long bonnet single-seater bodywork. The Montier never won a major road race, it was often victorious in the 3-litre class in hillclimbs. It is probable that the main cause of him retiring from racing, apart from his age (then being in his mid-fifties), was the merger between Ford France and Mathis creating the Matford line. He lost his Ford agencies, was forced to withdraw his entry in the 1933 GP de la Baule and retired from the sport. His son Ferdinand it seems did contest a couple of minor events in 1934 but that was the end of all Montier-Ford racing. After racing, Charles and Ferdinand went into a Taxi company at Paris, using one of the Montier Specials in city trim until WWII.